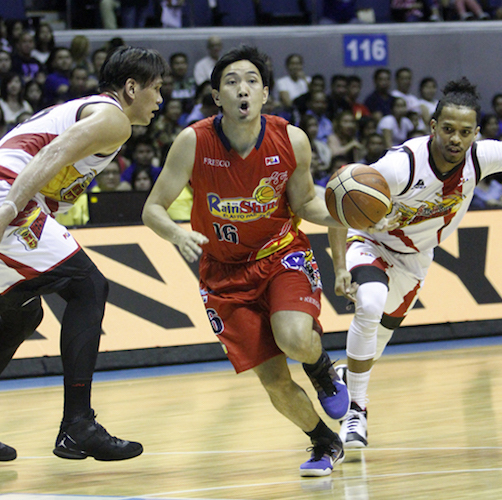 Jeff Chan and the rest of Rain or Shine are on the verge of eliminating the San Miguel Beermen. The San Miguel Beermen seem to like digging themselves into a hole. They lost in Game 2 to the Rain or Shine Elasto-Painters last night and fell behind 0-2 in their best-of-5 series, just one loss away from getting eliminated in the 2016 PBA Commissioner’s Cup semifinals. The Rain or Shine Elasto Painters survived a furious comeback by the San Miguel Beermen in the dying moments to escape with a 98-96 win in Game Two of the Oppo PBA Commissioner’s Cup semifinals Tuesday at SMART-Araneta Coliseum. Rain or Shine is now up 2-0 in the best-of-five series, just one victory away from making it to the finals. But the Elasto Painters needed to hang on from a late rally by the Beermen. Rain or Shine seemed on its way to a win after leading by eight, 95-87, with just 1:09 left. But San Miguel threatened with a stunning late comeback. Back-to-back triples by Alex Cabagnot pulled the Beermen just within two, 95-93, with 36 seconds left. Paul Lee widened Rain or Shine’s gap to four, 97-93, but Tyler Wilkerson responded with an and-one play to keep San Miguel just within one, 97-96, with 13.8 seconds to play. Lee then missed one of his two free throws on the next sequence, opening the door for the Beermen to steal the game. Marcio Lassiter banked in a tough triple at the end of the game, but unfortunately for San Miguel, the shot was waived as he didn’t make it before the buzzer sounded. Jericho Cruz set the tone for Rain or Shine, scoring 16 points, while Pierre Henderson-Niles piled up 15 points and 16 boards. Jeff Chan and Mav Ahanmisi finished with 14 and 10, respectively. Tyler Wilkerson collected 35 points and 18 boards in the losing effort for San Miguel, now on the verge of elimination.